Sometimes finding a way to spark students’ creative writing skills can be a huge challenge. 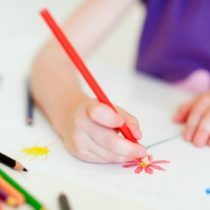 In the lower elementary grades it is important to not only provide appropriate skill level activities, but also ones that students can relate to. The ideas below are perfect ways to get your students involved and excited about creative writing without a lot of fuss. Let Art Inspire Adjective Awareness! Begin by having students suggest all the words (adjectives) they can think of that describe how lines can appear (e.g., wavy, zigzag, muted, bold, thin, straight, angled, curved, etc.). Record these adjectives on a chart pad, and transfer each one to an index card. Tip: You may want to make several sets of the same cards. Have students create free-form drawings on butcher paper. Read the word cards together, then have students select one or more adjective word cards that best describes the attribute of each drawing. Variation: You can also present this idea as a learning station activity. To do this, tape a number of papers in place on the table along with one or more adjective cards. Have students rotate around the table taking turns to add lines to each paper as directed by the adjective cards. Use a timer to advance students through the papers. Share the resulting art together. What are some of your favorite ways to spark students’ imagination? I like this idea. This would be a great way to discuss adjectives and give the studenst practice using them in their writing. Loving the ideas that are posted up. You give a fantastic idea and follow it through to ensure us early educators feel confident enough to take it on. I’m very inspired now to tackle some new early learning with children. I really like the idea of using Christmas figurines to spark imagination. I have a Christmas/Winter Village that I set up every year and it never dawned on me to use that to inspire writing! This is a great idea! Thank you! I have to quickly try the figurine idea with my first graders. I think they will love it as filler as we only have 2 days next week! I’m always looking for new writing ideas! I’ll have to try this! These are great ideas. I would like start my kids blogging. That will be great for them i think. We use Writing Workshop and encourage students to write about their life and things that happen. Students write amazing stories! My students have recently started using Storybird and making Glogs. They’re more excited about writing than ever! Love the ideas! Right now I feel like I am in a rut with writing. I think these ideas could spice up our writing time.